Animals from poor visual enviroments can evolve incredibly good hearing. For example, the nocturnal Tawny Owl can pinpoint the direction in which a mouse is scurrying within 0.01 seconds. But what about those animals who live underground? Ginny Smith was joined by Dr. Matthew Mason from Cambridge University whose work looks at the middle ear bones of subterranean mammals. Ginny - So, can you tell me how the middle ear bones work in humans. Matthew - So there's three parts to your ear. The outer ear is the bit that you can see, you've got the earflap and the ear canal, and if you were to go down your ear canal, at the bottom of it, you'd find your eardrum which is a very thin membrane. And the idea is that when sound comes in down your ear, that membrane will vibrate. Now, on the other side of the membrane is the middle ear cavity and that's an air filled space, one in each of your ears in the middle of your head. And sound has somehow got to cross that air filled cavity from the eardrum into the last part of the ear which we call the inner ear, and within the inner ear, we've got the hair cells and these are specialised cells with little hair-like processes. When the fluid inside the inner ear vibrates then the hair cells will turn that into electrical signals that the brain can understand. So, the bones that I look at are bridging the gap, if you like, between the eardrum and the fluid filled inner ear - three little bones which have to conduct the vibrations. Ginny - And why do we need them? Matthew - Well, the problem is that your inner ear is filled with fluid and this evolved in vertebrates a long time ago perhaps in aquatic vertebrates. And if you're aquatic, there's no real problem because sound is traveling in water. It can go straight into the fluid filled inner ear, it can vibrate the hair cells, and you can hear it. But when tetrapods moved onto land then suddenly, sound was reaching them through the air, and the problem there is, that if sound comes in through the air and it hit fluid, just like the fluid in your inner ear, most of the energy, 99 % or so will be reflected straight back off. And you can get an idea of that effect if you're in the bath, if your head is underwater, someone tries to talk to you, it's very difficult to hear what they're saying because most of their energy has simply bounced back. So, the middle ear device that we have, the eardrum and the three little bones, the purpose is to help to translate more of that energy from the air into the inner ear so we can actually hear it. And it's what physicists call impedance matching. But it means that much more of the energy actually gets through. It gives us a better chance to hear sound that's coming to us through the air. Ginny - Okay, so that's how it works in humans. What's different for animals that live underground? Matthew - Well, the problem if you live in a tunnel underground is what kind of sounds you're going to be receiving and people have done studies where they've played sounds in tunnels underground and it tends to be low frequencies that travel best. But even low frequencies don't travel very far. They only travel a few meters before the energy tends to be absorbed by the tunnel walls. So sound really doesn't propagate very well and then to make matters worse, many subterranean mammals are solitary. They live on their own, in their own tunnel system. The next neighbour is going to be in a completely separate system and then how would you communicate between yourself and your neighbour? So, two problems - sound doesn't travel very far and the tunnel systems may not be connected. So hearing perhaps is not terribly useful to you, but ground vibrations might be a better thing to detect because if you can produce vibrations in the soil or if something is producing vibrations in the soil, they can travel between the burrow networks and they seem to travel better. They can travel further. Ginny - So, how have their ears changed in order to pick up these vibrations? 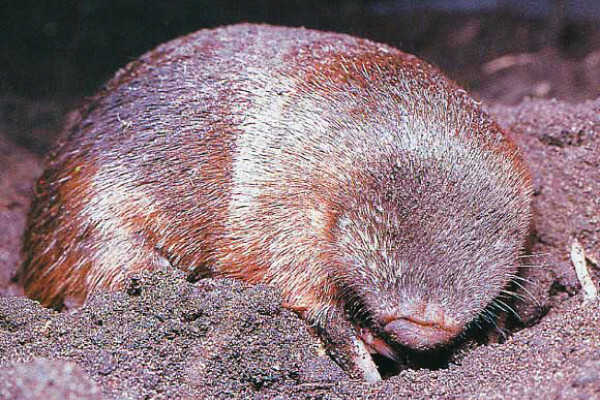 Matthew - Well, it depends on the group, but one of the groups that I'm interested in is called the golden moles and these live in Africa. These little guys are interested in vibrations that might be made by prey species for example. Now, what they've done with their ears is in essence, they've turned them into little seismometers. So, the middle ear bones in us, in humans and in mammals in general are usually very, very tiny and they need to be tiny in order to transmit sound vibrations effectively. But in the golden moles, these bones have become very, very large in some of the species. And so, we've got this disproportionately massive ear bones. Now, let's put this in context. The Namib Desert golden mole that I look at is about the size of a mouse, but its ear bone is twice the size of a humans. Now, that perhaps doesn't sound too impressive, but if you imagine the mole blown up to the size of us, it would be like us, having a solid lump of bone, the size of your fist in each of your ears. Ginny - Wow! That doesn't sound very comfortable. Matthew - It isn't but it might be useful for detecting vibrations. So, the idea is that if you had happened to be touching the ground the ground was vibrating, then your whole head would tend to move, but these great lumps of bone will tend to stay in one place. And that would give you some relative movement and then that could go to the hair cells, the hair cells could pick up those vibrations and suddenly, you've got an ear that can detect ground vibrations. You've got a seismometer. Ginny - So, does that mean that these moles have to literally bury their heads in the sand in order to detect vibrations? Matthew - They absolutely do, yes. So, the Namib Desert moles have two ways of getting around. They can burrow through sand, but the problem with sand is you can't actually make a burrow system because it just collapses behind you. So, if you're burrowing underground, you've always got your head in contact with the sand. And in fact, they use their head for burrowing anyway so it's always in contact. But sometimes these little guys like to run around on the surface which is perhaps less energetically costly, they can go further, it's easier to do it. But if they run around on the surface, they've got this problem that they're not touching the ground. But what they do every couple of feet is they stop, they actually push their heads into the sand and listen. Ginny - And how far can they hear? Matthew - Well, we don't know that, but we do know that they seem to be able to locate grassy tussocks where their prey lives, at distances of up to about 20 meters. At least they seem to know where the tussock is and they head towards it. Ginny - Brilliant! Well, that sounds fascinating, but I can't imagine walking around with two fist-sized lumps of bone in my head. I think I'll stick to our version of hearing. Next How well can sharks smell?